I spent an evening looking for story generation games. Not computer games that had interactive story generation, but meta-games whose result was a story, computer or non-computer games. Ideally, I was imagining something that would be played by two or more people, maybe turn based, that would take creative input from players and guidance from a simple set of narrative generation rules and create a story. Something like Exquisite Corpse, but with output that was narratively interesting. Or similar to Kischka and my Guess What Game We Are Playing? game, but with a story rather than a game. What would a game like that look like? Some random element? Mutual interaction between players of the meta-game and the evolving story? Some narrative rules? The goal is to generate a single narrative with characters, plot, and conflicts. It might ultimately steer characters toward the greatest conflict or difficulty. Where would the setting come from? Where would the conflict come from? Would it be known at the beginning or evolve? How would the major characters be defined? Minor characters? Could you use a deck of cards? A Tarot deck? Apparently others have thought of the Tarot deck as a story generator as well. I thought I’d kick this blog off with a twist on an old classic – the Celtic Cross. My twist, the Fictional Cross, is a useful spread that I use to generate plot ideas from scratch. S – The Significator card. Pick a court card that represents the personality of your protagonist. If you don’t have an idea for your main character yet that’s fine; separate out the 16 court cards (that’s the Page, Knight, Queen and King of each suit) shuffle them and pick one randomly. That’s your main character. You can refer to any good tarot book to find out what kind of person they are. 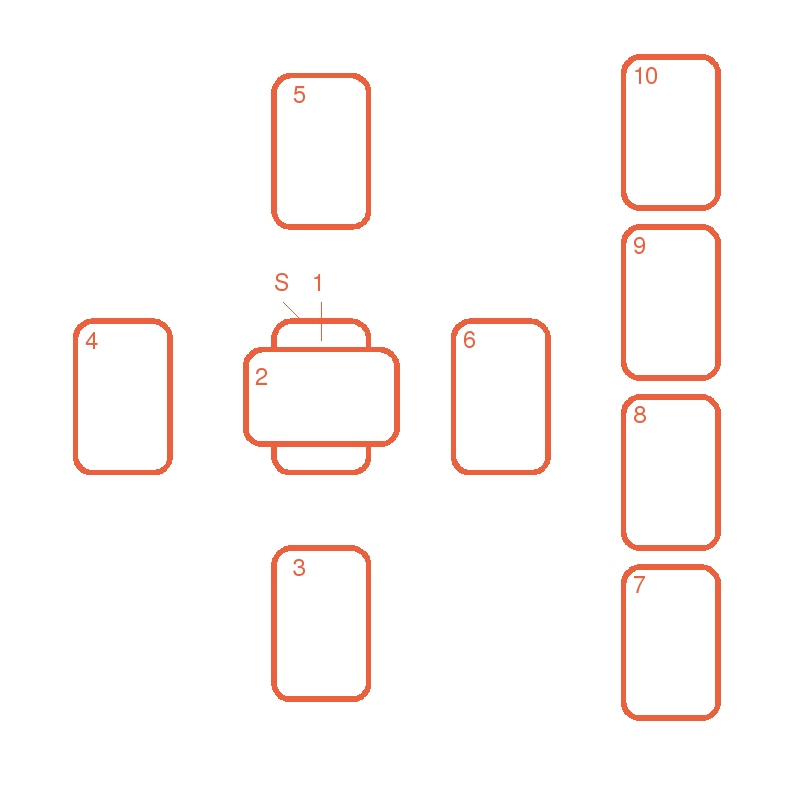 Now shuffle the rest of the court cards back into the deck and lay out the rest of the spread. 1 – The Centre card. This card is your protagonist’s attitudes and feelings at the point your story opens: their internal situation. 2 – The Crossing card. This is the external situation that your protagonist is in at the very start of the story. Together these two cards suggest the stasis, the normality, which is about to be changed or shattered by an inciting incident that sends you protagonist hurtling through the story. 3 – The Back Story card. This card shows the basis of the story. An event that happened before your story began that has set things in motion. Because of the event in this card, circumstances are unfolding that on a collision course with your main character. This collision happens in the next card. 4 – The Inciting Incident card. The event that gives your main character a kick up the backside and sends them out of their comfortable normality and into the story along a path suggested by card 6. 6 – The Direction card. The path that the main character initially sets off along towards their goal. 5 – The First Act Outcome card. What the main character achieves at the end of the first act or the situation that they are in at that point. After this the story will take a turn in a new direction. So far most of the cards have focussed on the main character and getting the story started. For me that’s often enough of a story seed for the ideas to start sprouting and rioting in my imagination. But the next four cards help suggest some structure for the second and third act of your story. 7 – The Protagonist card. So we saw the protagonist at the start of the story, where they were both internally and externally. They have followed the path that they were pushed down by the inciting incident to a first act climax. Until that point the protagonist has been controlled by events. Now, in the second act, the protagonist makes a decision on how to go forward. How the protagonist goes forward from this point is suggested by this card. 8 – The Antagonist card. What good would a story be without a villain? This card suggests the main antagonistic force that is preventing the main character from reaching their goal. The antagonist can be a person or a set of circumstances. You’re reaching the end of your story. How do you want things to resolve in the third act? 9 – The Reversal card. In the Celtic Cross spread this card is listed as hopes, fears or the unexpected; in the Fictional Cross I go with that last meaning: the unexpected. Things can’t just wrap up neatly, there should be a twist in the tale. At the point where the protagonist thinks they have it all worked out and the ending is in sight, something pops up and sends the ending spinning. 10 – The Resolution card. H ow does it all end? When the dust settles, what is the situation that the protagonist finds themself in? The diagram below shows how I relate this idea generation spread to the traditional three act structure of storytelling. Give it a try. Let me know how it works out for you in the comments. Use this spread to generate an idea for a full plot. The Stasis card depicts the situation before the story begins. It is crossed by the Trigger card, which signifies the event that sets the story in motion. Next follows the Quest card that suggests the course of action that the protagonist embarks upon as a result of the triggering event. The Surprise card suggests an event that occurs to throw a spanner in the works and send the plot spinning in another direction. In reaction to this surprise the protagonist must make a Critical Choice about how to proceed. The critical choice is depicted by the card crossing the Surprise card. As a result of the protagonist’s choice the climax of the story is reached – everything comes together and appears to be resolving in a certain way. The Climax card suggests how this plays out. It is crossed by the Reversal card, which suggests an event that changes the fortune of the characters involved in the climax and paves the way for the resolution. The Resolution card defines the new stasis – the way everything shakes out after all the excitement is over. I came here searching for tarot story game.